Have you found an online vendor selling Gosling's Family Reserve Old? 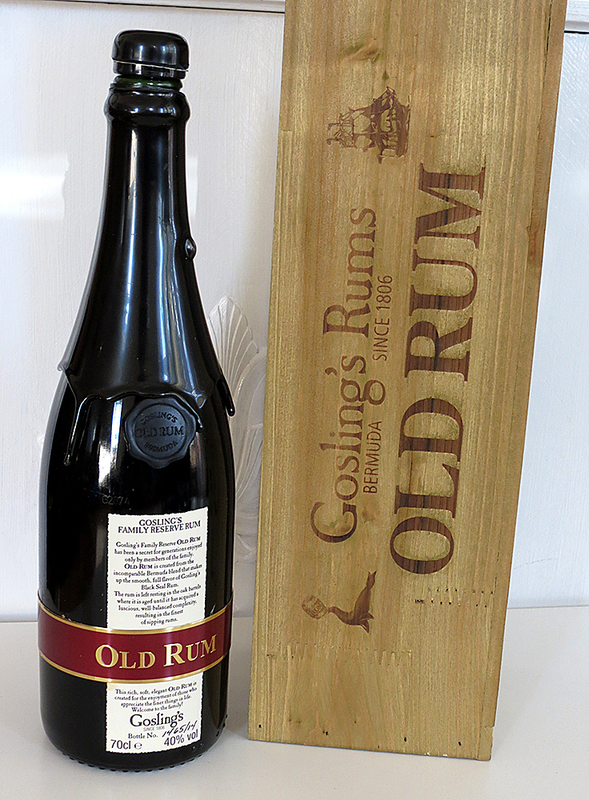 Gosling's Family Reserve Old rum is crafted in Bermuda from the same blend as Gosling Black Seal but is aged longer in dark barrels. Each bottle is hand-labelled and numbered. If you like to sip Gosling's flagship Black Seal rum, you're gonna really enjoy this much smoother, more elegant version. It's rich, thick and full of the flavors which Gosling's is known for....chocolate, port wine and spices. Don't mix this with soda pop! Perfect just as it is. A nice champagne bottle with wax and a steel band around it. Each bottle has its own number. The rum comes in a nice wooden box. High class in the presentation (picture). This rum have to rest in the glass for a bit. At first it´s a lot of oak but when the rum rests in the glass you get sweet aroma with caramel, raisins and spice. The taste is spice and a bit sweet. I expected it to be sweeter. The finish is long and mild. This rum really have to rest in the glass before you drink it. Gosling's Family Reserve is a blend from Bermuda. It comes from the same barrels as the Black Seal but is aged up to 16 years. It has a very complex spicy nose which is really intense. It can literally fill the whole room. Gosling's Family Reserve is a true premium rum delivered in a nice wax sealed and hand numbered bottle. It is very complex and combines a litte sweetness with nuances of wood. It has spices, dried fruit, choclate and tabcco and is very well balancedand; soft all the way. I was lucky to get my one for only $60 in Chicago and can only recommend to give it a try. You won't regret it. Looking for a sweet dark old rum to savor with a big cigar? This one would be my choice. The only Gosling's rum available locally is Gosling's Black Seal and frankly I was not all that impressed with it. I've read the hype and felt it didn't come close to living up to it. I can across the Gosling's Family Reserve rum at Dorignac's grocery store in New Orleans and decided to get a bottle to try. I am finally getting around to sampling it. First a word on the presentation...this is old school at its finest. The deep green glass champagne bottle is sealed with a thick black wax which includes a wide pull band to help unseal the wax. Each bottle is label with its own bottle number (mine is 5867/14) and is placed in a straw-filled wooden box. Homage to the old school. Pouring the rum into a snifter revealed just how dark this rum is. Almost like new motor oil (and I do NOT mean that in any negative way -- just that the hue is a rich, dark brown of a type reminding me of how certain motor oils look). The aroma is sharp and crisp revealing a pepperiness that becomes apparent on the initial flavor. Some sweetness along with the peppery sting and a buttery texture. There clearly are other flavors but the pepperiness obscures them too much for me to detect what they are (others with more refined palates than mine will have to chime in). Some oak tones as well but mild. The finish is a bit dry and the oak stays with you. Very smooth with not a burn but a nice warmth that is far from overbearing. Personally I would not choose this as a sipping rum but it definitely qualifies as one. It's not for everyone but it is a pretty good rum. I know I may ruffle some feathers but even though this is a premium rum I like it quite well in Coke Zero. The pepperiness complements the Coke Zero flavor making for a unique combination. Add a little lime and you've got an awfully good Cuba Libre. But at approximately $70 (USD) a bottle it's kind of an expensive Cuba Libre. A cool bottle, that contains something that, to me, feels a little bit like a spiced rum. The nose is a little oaky and bittersweet, with dominant notes of cloves. The taste is kinda special. It contains a healty dose of slightly bitter barrel notes and hints of dates and allspice. Unfortunately not really to my liking. It's really pretty good. Not the brice I'd like for how it tastes, but they have to have at least one high end product. Very very dark color, strong oak tones mix well with the usual black seal flavors for a more mature and strong mouth feel. While it stands ok on its own, it pairs perfectly with dark chocolate. Highly recommend a nice dark bar with a glass of this. Amazingly, I found a bar that had about a half dozens sipping rums on its rack. A guy at the bar identified this rum as his favorite among them. This is a very good rum, very smooth, little or no burn. However, its price point is its downfall and I deducted a point for it. It is not 30 dollars better than my favorite rum. The bar owner said it had jumped so much in price lately that he would not continue to stock it. Apparently, their desire to go up market could hurt their sales. Was bought a bottle of this for my 40th, and it did not disappoint! Very dark complexion. Not much in the nose - except vanilla and tobacco. This rum needs time to develop its taste. It is then full of tobacco, oak and dark chocolate. Aftertaste: a lot of dark chocolate. I like this kind of rum, but can understand if it is not to everybodys taste. My purveyor sells this for just over $50.00 which makes this an excellent rum. At the estimated $86 it's still an excellent rum but lacking in a few things. First is the ABV, I would really like to try it at 42-43% rather than 40. Another thing would be the packaging. I really do not need a wooden box with a plexiglass slip front and a rope handle. Extra expense that just gets tossed out. Whats inside the bottle is really good stuff. Tons of wood and the spit of residual bourbon. Big nose that invites perpetual sniffing. Not overly sugary which is always a good thing with aged rums. Maybe a tad thin on the tongue which is one of the reasons I'de like to see this less diluted. 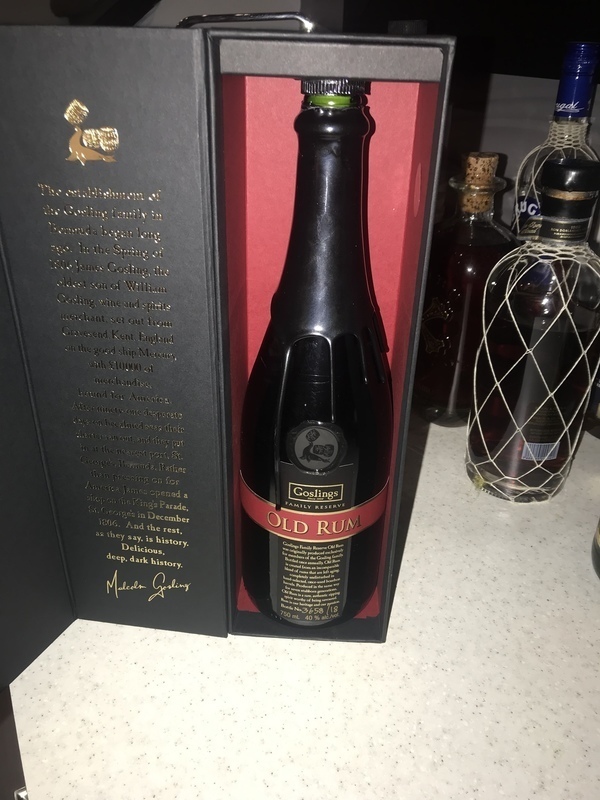 If you find the likes of Centenario 25 too sweet as I do and your looking for an aged sipping rum, if the price is right Gosling's Old Rum is a great choice to try at least once. Quite a unique taste, I always wondered how people got chocolate from tasting rum, but that's the first thing that I noticed with this. Nice dark mahogany colour, interesting flavours and good aroma. Top marks for presentation. Worth having. Tvrdší, těžší rum pro zkušenější fanoušky. Ve vůni je cítit silný nádech dřeva (dub) a lehký závan višně. V chuti se dělí na 2 fáze. Zpočátku velmi hořká (trpká) chuť přechází do silnějšího, ale již ne tak trpkého závěru s dlouhou dochutí. Přestože mi silnější či těžší rumy nijak nevadí, nedokážu si představit popíjet tento rum celý večer. Na vině bude zřejmě ona trpkost, která přebíjí ostatní vlastnosti jinak kvalitního rumu. Ač je zjevná snaha o originalitu s číslováním každé láhve, finální champagne verze mi připadá pro rum spíše nevhodná. Like the label and webpage says, this is indeed a very well defined rum. Wonderful flavor and aroma.Everyone needs to try this one. It was especially nice served over some North Atlantic Iceberg. Very unique rum. Smells like burned sugar and fruit. This is also present in the taste. First sip was a bit harsh, but the 2nd sip onwards was really nice to sip on. My palette is not advanced enough to describe all the different flavors, but this is something special alright. Big step up from the regular Black Seal, which is a decent mixer. Gave this one an 8, but is very close to a 9. Might upgrade after a few more glasses. One of the best bottles. A Nice dark rhum with lots of dried fruits in the aroma. One of the very best rums I have had, whether it is worth the $60 price tag is a matter of preference. I would likely rather have a bottle of Mt gay extra old and a bottle of El Dorado 12, but this is one any rum lover should try once. Everything an aged rum should be - rich, complex, fruity, woody, with a sweet finish. 40%. Don't let the packaging fool you... there's no age statement (NAS), so could be 2yo (or unaged) with a drop of 16. Also no additives disclosures. Notes: whoa, big chocolate chip cookie rum. Loads of brown sugar. Very rich and sweet. Very sweet. Slightly bitter, molasses-y finish, with a good bite. A very strange experience, for this price point. 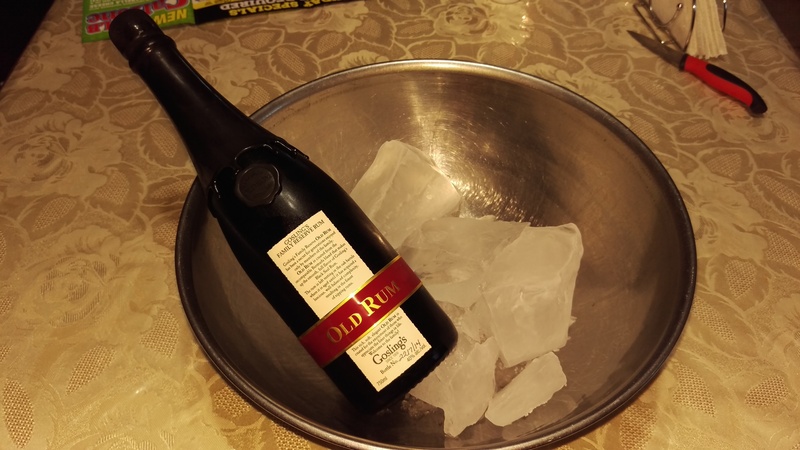 I tried it at the house of a friend who is also into rum, and had been given a bottle by another friend. We all tried it, and praised certain qualities, but when the gifter left the room, my friend and I exchanged knowing looks. We were both pretty disappointed. There may only be 15g/L of added sugar, but the whole package is just sweet and messy. I'm really not impressed, and I don't want more. I don't drink rum for dessert. This is kind of an insult. And it just saddens me that so many people are willing to shell out so much cash for a mediocre rum when so many better ones are available for far less! Made from molasses from what I understand. Accordingly, tastes a little more complex and deeper than most of the rums I've had so far. Still pretty smooth and very good. Better than a lot of the ones I've had so far. At the moment my favourite sipping rum. Smooth and flavourful. I prefer it it neat, no ice. Very smooth and exquisite taste! I cannot wait to get some more Cigars! Thought this rum would give a lot more. Aroma is not as strong as it should be and lacks punch in flavour. Good colour but doesn't seem as viscous as it should be.